Firstly guys, I would like to say “Hello, I’m back”. I haven’t blogged for over a month. Work has been manic and so I haven’t had a moment to think. 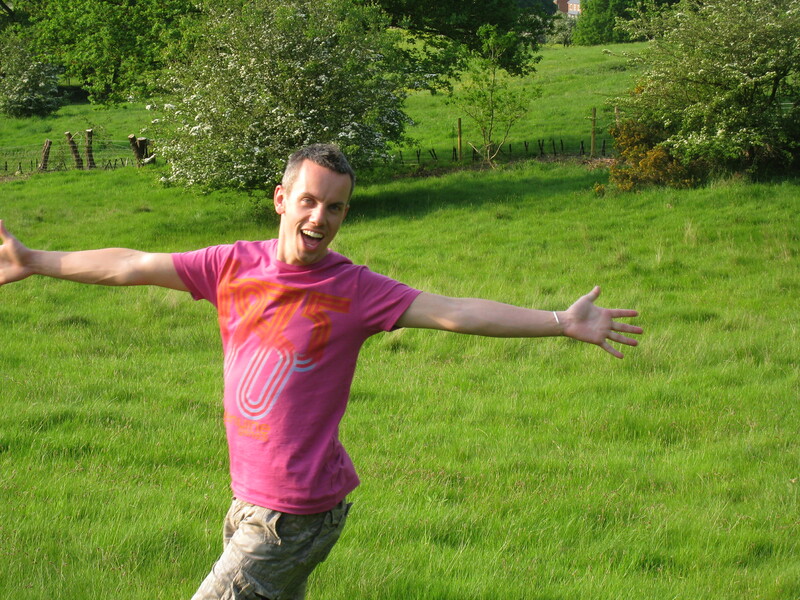 At the end of September I flew over to London to take part in the first ever ‘Big Gay 10k’ run. I was very excited about doing the run. It was my first ever run. I was going to crawl and possibly die in a gutter do my best and try to get a good time. Well – 400 people took part in the 10km run in London. Some were runners, some were walkers and the rest were mincers! The route was fantastic! Here are some photos from the fantastic day. (I’m in the blue vest, my fiancé is in bright yellow). Our super friends Sue and Caroline came to support us. 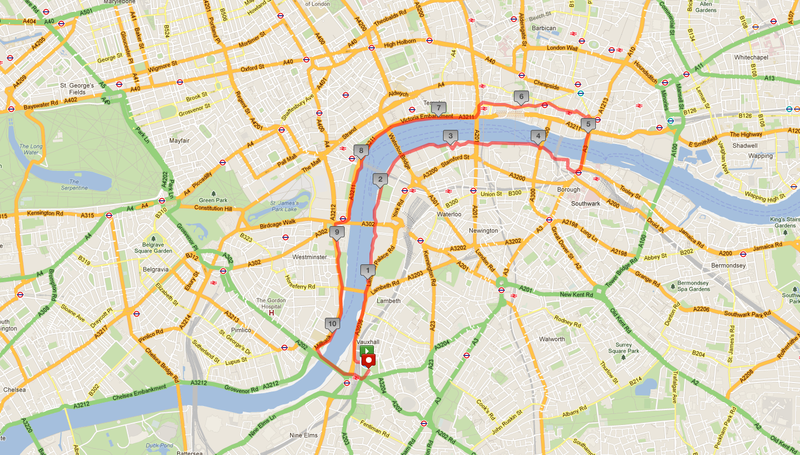 The fantastic route with London’s finest landmarks all the way around. The race was started by Cheryl Baker, in pink in the photos (from Bucks Fizz, the 1980s pop group who won the Eurovision Song Contest in 1981). I even met her and had a post-run-sweaty photo together. Once the race was started, Bas and I were off like a shot. My music was playing and I was high on adrenaline. I wanted to get a good time. 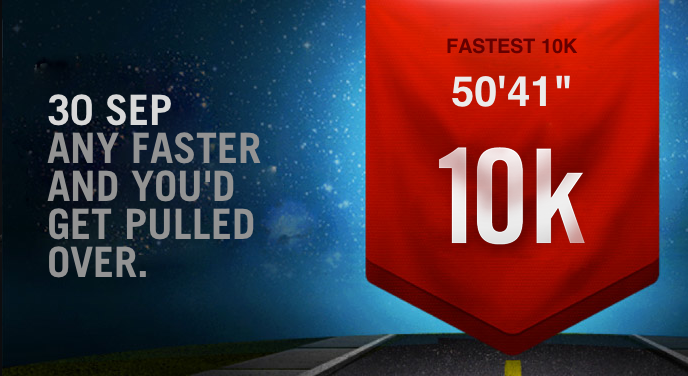 So far my best time had been 10km in 52 minutes (I was averaging 55 mins). Halfway through the race I realised that I was well over my usual pace. I got ahead of Bas who probably got caught in the crowds. Bas caught up with me at about 7 or 8km into the run. That was when we came face-to-face with the photographers. (Time to look as though I was loving it…). At 8km I hit the wall. Not literally – a wall of pain. I really didn’t know if my body would get to the 10km finish line. Bas was brilliant and ran along side me the rest of the way. The last bridge was the last hurdle. I said to Bas “I don’t want to go uphill anymore”. He replied that we were there. We came 28th and 29th (seconds divided us). 29th!!!! From 400!!!!! Stunned. You can see my time below. Just under 51 minutes. It probably took me those 41 seconds to stop my timer. You can see how much money I was lucky enough to raise for a great charity in London! Brilliant supporters – thank you! Proof on my time! I am still in shock that I managed it. The breakdown of the route. 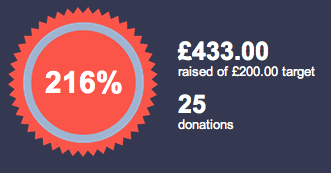 The amount I raised for ‘London Friend’. Jumping off a mountain. Simples. What better way to remember a birthday than by jumping off a mountain. That was how I celebrated my 32nd birthday. It could have been my last. Paragliding is a must. I am now converted the wonders of the jump. I’ve just got back from a two-week camping holiday in France. It was amazing. Lac d’Annecy is a stunning location for a holiday for all tastes. Relaxing if you like. Sporty if you want. Adventurous if you dare. Our paragliding experience was well organised. A team of instructors picked us up (me, Bas and A.N.Other). We headed up a windy and very steep death trap mountain road. The madman driver clearly hadn’t taken his tablets knew the route and we whizzed around bends on two wheels. Oh the joy. We reached the summit and grabbed the gear from the back of the minibus. What was the gear being strapped to my back. I asked no questions. I didn’t really want to know. We walked a couple of metres up a pathway and then on to a steep slope of astro-turf (fake grass) which led over the edge to nothingness….. Long grass could be seen poking up, but beyond that…nothing. The lake, hundreds of metres below, was shimmering in the mid-day sun. Stunning. Terrifying, but stunning. My instructor lay the wing (or canopy) out across the grass, while I looked at at the view and contemplated the drop. There were loads of ropes called lines (yes, I’ve read up on it now that I’ve done it and survived). He untangled the whole lot and prepared it, then attached his harness to mine. Once secured he said “Right, now we just run”. That’s the extend of my pre-flight briefing?….”Now we just run!??? ?” (I thought this part – I didn’t want to sound panicky). We ran…Off the edge of the mountain. I was expecting a sudden drop. It never came. Unbelievably, we glided off the mountain and into the air. It was the most gentle take-off I’ve ever experienced. The view was amazing! I was silent. In total awe of the view. The lake below looked incredible. The instructor was busy controlling the wing (fiddling with the lines). I just grinned and enjoyed the view. I looked across and watched Bas and his instructor floating ahead of us. I didn’t hear any screams. All was good. For thirty minutes we floated down above the lake, the trees and roads below. There had been no wind at the top of the mountain. It was eerily still. Once we were a few hundred metres from landing we hit a rush of wind. With a jolt we were carried higher and higher. It made landing quite a challenge. Our landing field was too far to reach and the wind was too strong. Plan B – land closer. We ended up in a field nearby. The landing was smoothe. Until a gust of wind caught the wing and whipped us backwards across the field. What a sight. The instructor was laying on his back trying to regain control and there was me, on top of him, wondering when we’d stop. I couldn’t help but giggle some more. I survived. I loved it! Want to read more? Some links you may enjoy. My rather less successful ‘outdoors’ adventure in France: kayaking. Lake d’Annecy: A fantastic place to visit. Beautiful Bali: Where calm meets chaos. When you arrive in Bali (at Denpasar airport) there is an immediate feeling that you have stepped back in time. The airport has a 1980s/1990s feel about it. Things just are not as modern here. Once you have shown passports to security, who are seated by little wooden crates (bizarre I know), you collect your bags and head out. Next you are faced with a row of cubicles (all glassed in) with money exchange workers all frantically waving and smiling to get your attention. It feels as though you’re in a red-light district with ‘ladies-in-the-window’ and is somewhat unnerving. It’s difficult not to stare (or laugh) at the weirdness of it all and so you find yourself quickly dashing along. I managed to avoid being lured in to any of the stares. Phew! Outside the airport there are streams of taxis everywhere. Luckily we had a pre-arranged minbus transfer arranged to take us from the airport to our villa, but it seemed easy enough for people to flag one down. 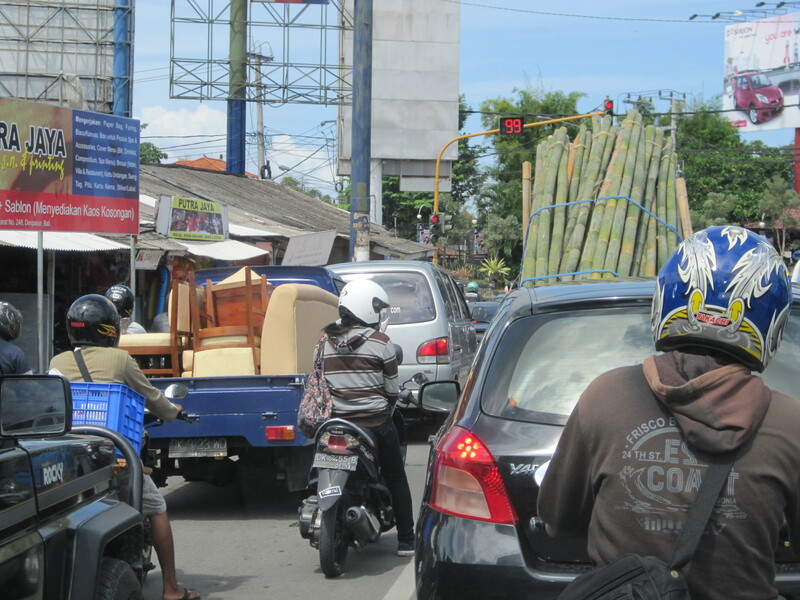 The carpark is chaos and if that’s anything to judge Bali by…..it gets busier. 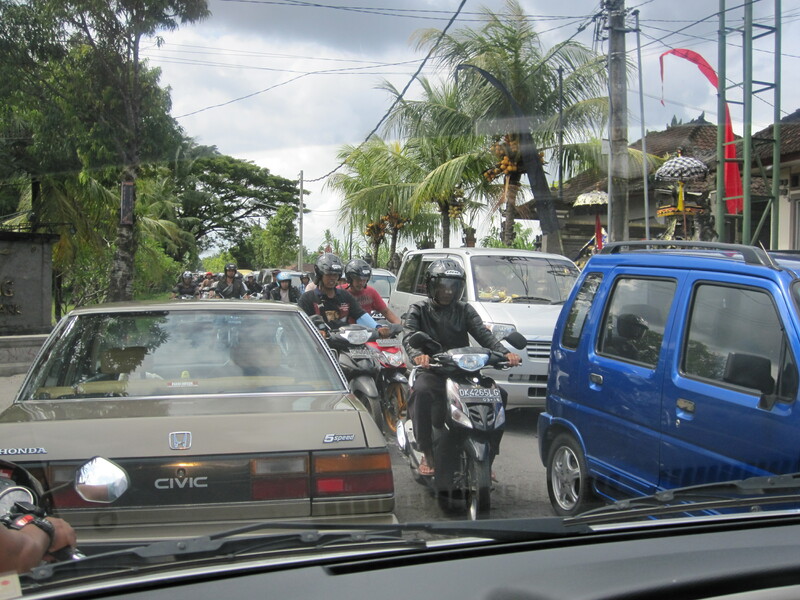 The road from the airport to Seminyak (normally 20 minutes drive) was packed and the journey took over an hour. 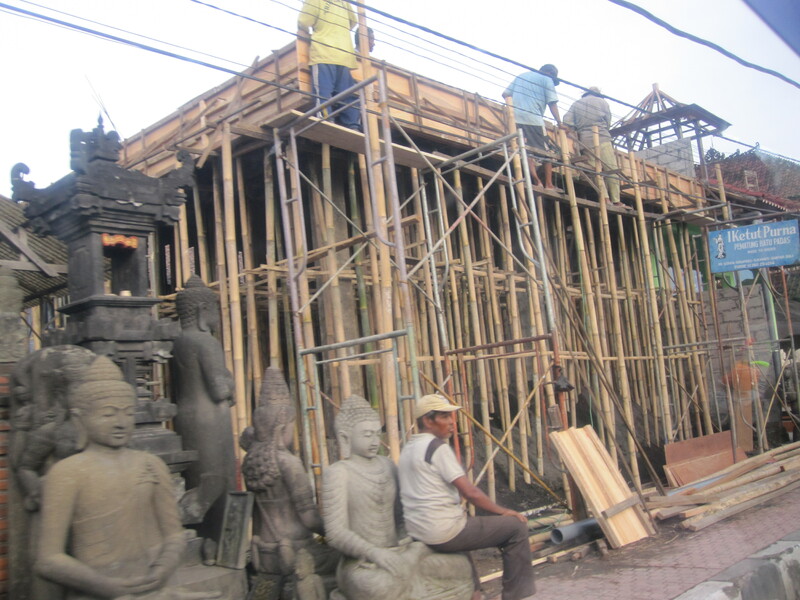 Seminyak is one of Bali’s hotspots. Located on the south of the island, by Denpasar (the island’s capital), Seminyak boasts a huge number of private villas, restaurants and bars. It draws in tourists from all over the world, but in particular Australians (many of whom are enjoying their hen-weekends or stag-dos). So many of Bali’s visitors stay in private villas. I can see why. Behind the doors, away from the chaos of traffic and tourists passing by is a tranquil and harmonius villa. Inside the villa, my eyes quickly did the dream-holiday-checklist. Pool. Open-space. Lounge. Kitchen (I don’t plan on using it, but still….). Bedroom one (huge). En-suite (love it). Bedroom two (also huge). Another en-suite. Decking around the pool. Water feature. My eyes at this stage are flashing from one place to another. I’m greedily taking it all in. Heaven. Staying in a villa in Bali can be a dangerous move. It’s not life threatening. It’s culturally dangerous. You might become so relaxed and ‘chilled-out’ behind the closed doors that you end up spending your time there instead of exploring. Don’t be too chilled. You must explore. The nightlife in Seminyak is mixed. It doesn’t have the feel of a stag-do and hen-do holiday destination. It’s not like Blackpool (UK) or Amsterdam (Holland)….. or anywhere else that you find pre-wedding groups drinking their last moments of freedom away. It all seems slightly more classy here in Bali. There are security guards EVERYWHERE. Do not panic. They stand at the road side by every villa, bar and restaurant. If anything you feel safe with them all around, but I did wonder whether they were security or hotel staff (the strict uniform can be quite deceiving). They all carry lightsabers which I found very amusing. Not quite up to the standard and length of Darth Vader, although they still light up red and look great fun at night. There are cars. Bicycles. Motorbikes. Mopeds…… For every car there are about 10 mopeds zooming beside you. Think mayhem. 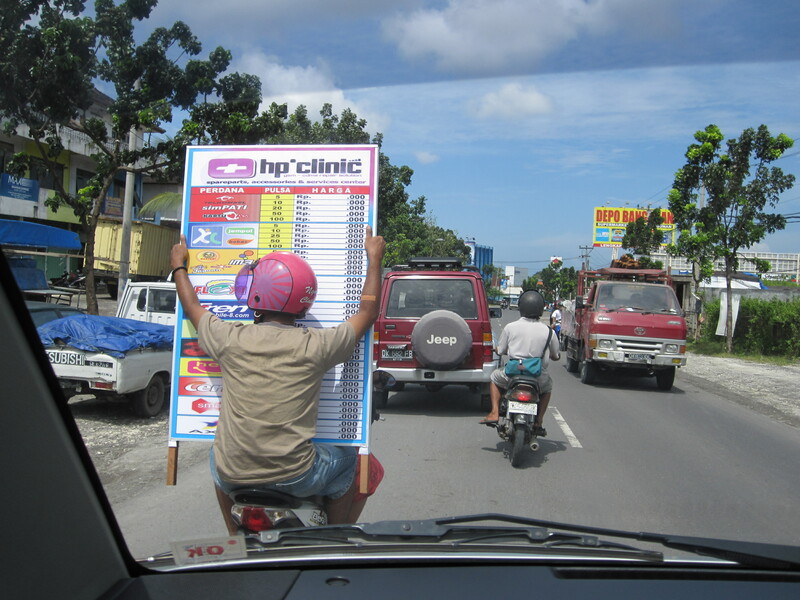 Controlled mayhem, although I wouldn’t dare get on a moped in Seminyak. Next, you see what they are carrying. We’re talking full loads. 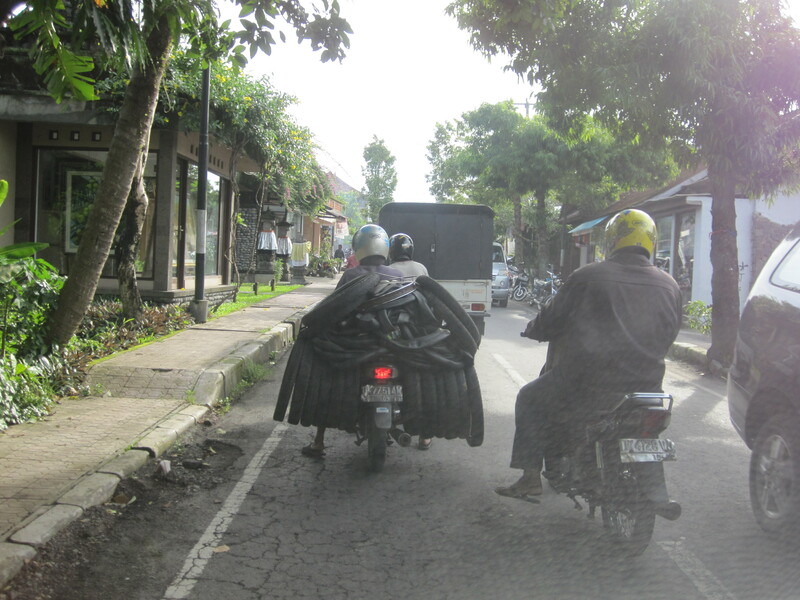 Mopeds with 4 passengers (oh, plus the driver)…..and one of the passengers is carrying a adult-sized bike on the back. It’s crazy! 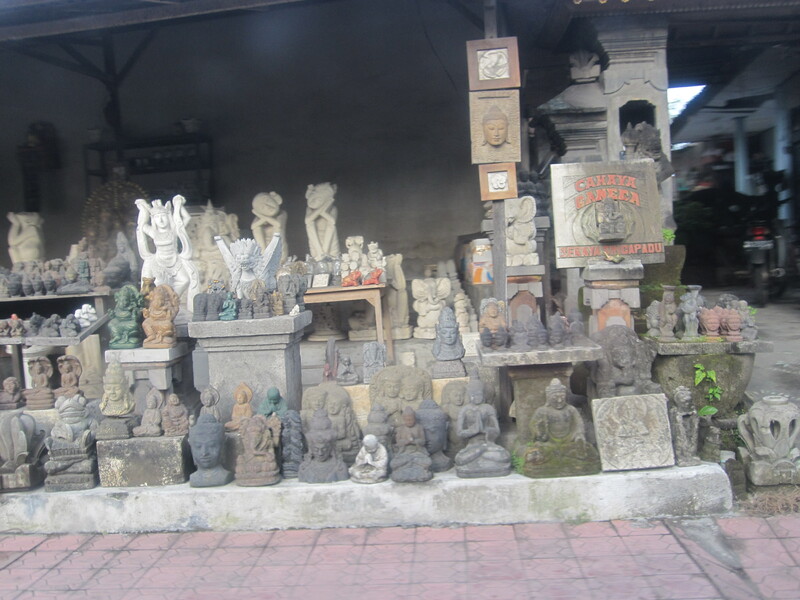 Along the road side there are hundreds, possibly thousands, of shops selling wooden carvings, stone work, mosaic bowls, kites and more….and more…..and more. The shops repeat and repeat and repeat themselves along the longest straightest road. My poor camera. There are lots of hot spots to visit. 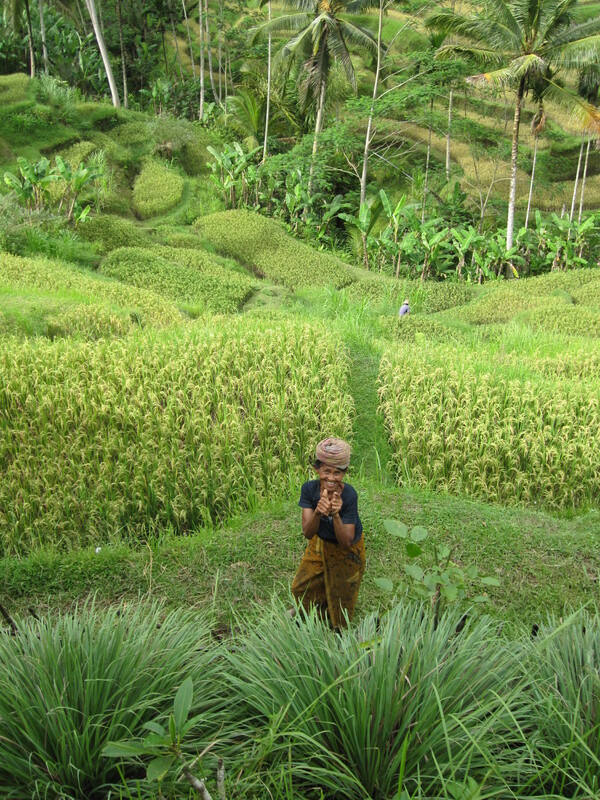 We choose to visit Ubud with the rice fields. If you have never visited places like this (like me) then all expectations are blown out of the water. The rice fields were great! I wasn’t expecting the slopes to be quite so steep. The driver let us wander and explore. We sat by the edge of the rice fields and had something local to eat. Yum. The journey back was just as interesting – more shops and sights to see. 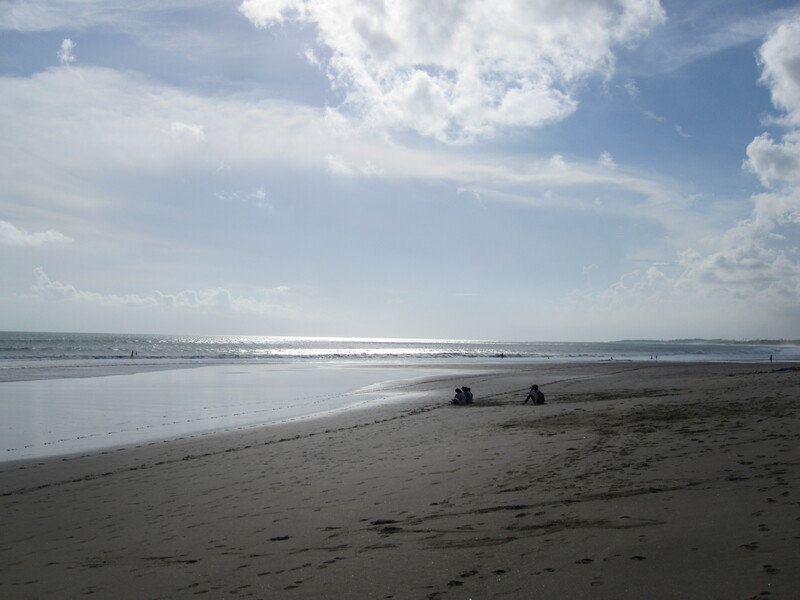 In Bali, aside from the wonderful Ubud and the shops we also ventured along the coast. The sandy beaches are beautiful. Palm trees line the coast and add to the holiday feel. 6 months of blogging. 6 things I love about it. It’s been 6 months. How can it already be 6 months since I sat behind my laptop and created ‘One Life’, my WordPress blog? It’s been a rollercoaster of a ride but I’m sticking with it. I love the surprises. Here’s my list of 6 wonderful things that I love about my first 6 months of blogging. I love sitting at my laptop and reliving an experience. Whether I’m writing about a recent trip away or about something funny that I have seen – It’s great to write about it. Somehow I feel it captures the memory and makes it more permanent. I do have a bad short-term memory and so it’s not such a bad thing. Plus, it’s always funny to hear what others think about what’s been going on. Making friends via WordPress and Twitter. The people I have connected with via WP and T make me smile. They comment on my posts and give great feedback for making it better. (Special hi to Terri, Terri, Jamie, Ashley, Melissa and thesinglecell). 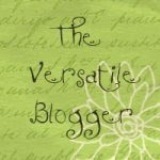 I’ve added great blogs that I enjoy reading to the Blogroll on my sidebar. They really are worth checking out. Some of the people who I have connected with have become borderline stalkers. Online stalkers though……and I love it. If you too want to follow my blog then you can subscribe. Equally you can click to stalk follow me on Twitter on the sidebar. Condoms are more popular than I ever though possible. It’s quite unbelievable, but it’s true. ‘Condom’ is the most popular keyword used to bring people to ‘One Life’. Ah, yes………I did blog about them a while back. Here’s my most popular post about condoms. "Oh, that's just made everything in the world seem better". I follow the locations of people reading ‘One Life’. I don’t have secret tracking devices out watching you all 24-7, but I can see on the world map where the readers are from. 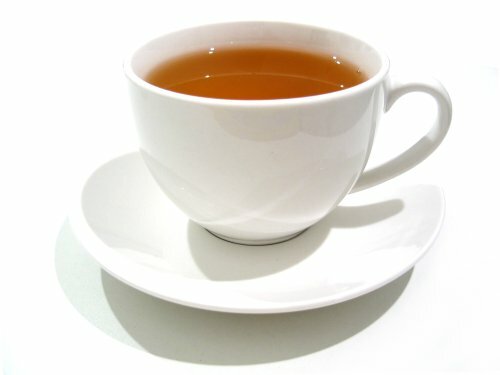 My biggest audience by far is the United States (howdy)….. Oh sigh, that’s poor, but I thought it would be better than mentioning ‘tea’ (coming from a Brit that is)…… Talking of tea though, I posted about tea and it’s very popular. Tea and its magical properties. If you haven’t read it then take a quick peek. Lists! I love the lists. I created a list of things to achieve/do/experience in 2011. 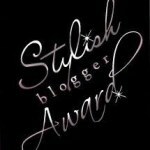 Lots of other blog friends have created a 101/1001 list. It will take them ages to achieve – but what a thing to do. Look, this post is just another list. The best bit about WordPress and blogging is find out that I’m not the only one…… I’m not the only one who does stupid things, has a bad memory, forgets things, loses things, says the wrong thing……. It’s a relief. Let’s all give each other a big blog hug. There, didn’t that feel better? “Take your shoes off when you we go to bed”…..said the waitress. That’s what the nice waitress from the Czech Republic said to me. I was expecting a drink – not an invitation to bed. “If you could just take of your shoes when we go to bed…” I had to do the double-take…. The ‘sorry-did-I-hear-that-right’ look… I was stunned and then I realised that it was ‘all part of the experience’. I feel I should explain – I was with friends. Yes, I was taking 5 friends to bed with me too! BED is a great cocktail bar in Prague. It was discovered quite by accident after a long day of walking and city exploration. Tucked away on the quieter corner of Prague’s main square the bright white and pink sign stood out and we were instantly attracted (like flies to the light). Inside everything looked hip and trendy. There was a very cosmopolitan feel to the bar. We were keen to enjoy a couple of cocktails before moving on to another bar. That was the plan – but when do those plans ever work out? Here we are - just ordered our cocktails. There were no chairs and tables in BED. Everywhere you looked were huge lounger-beds with people laid flat-out or snuggled together (shoes off) and enjoying their drinks. We were escorted led down a spiral staircase to the brightly lit basement. (This all sounds so much worse than it was. It was not a dodgy bar. It was very nice and bright). That’s when our waitress told us about ‘going to bed’. We slipped our shoes off, giggled a bit – It all felt a bit strange (it doesn’t happen in most place of course) and then we hopped on to the huge mattresses. The walls, floor, beds, sheets, tables were all white. The lighting was blue and it gave the place a surprisingly warm feel. The music was great. 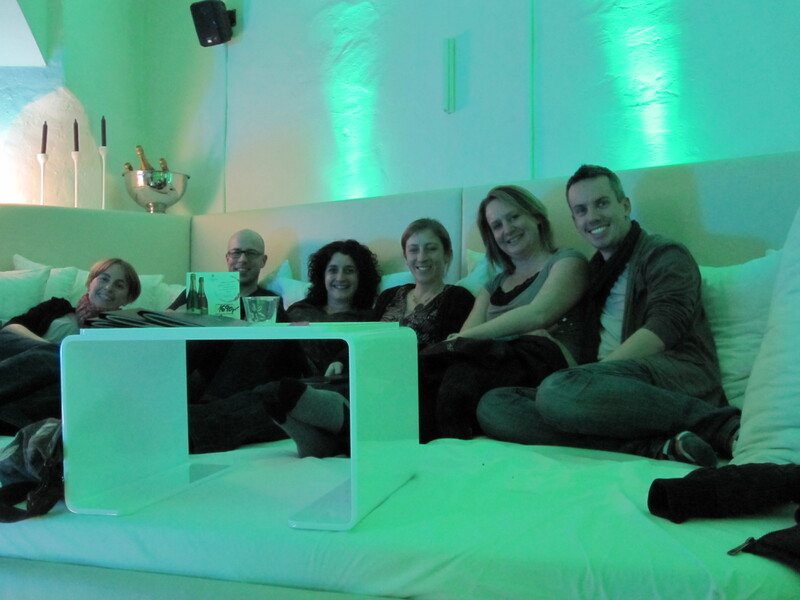 Chill-out lounge – we loved you! The chill out beds - just before people arrived. Easier to climb down that up, after a few cocktails. I can see why the place is so popular. Why don’t more bars do this? It was so comfortable. We lay back and stretched out. Our bed could have easily accommodated about 8 people (or more). We looked at the cocktail menu and ordered. This was the life! Pure relaxation. About 3 hours later – all plans of ever moving on to another bar had gone ‘out of the window’. We were staying here. It was too good a place to leave. We had watched other groups and couples arrive and give the same puzzled looks as they de-shoed and hopped onto a bed. I love to go out and enjoy an evening with friends. This bar will stay in my memory for its individuality. If you’re ever in Prague you must take a look. BED in Prague. A must see! Bring Me Back to Bed (look, someone else has been and loved it too). “Bags packed. Tickets printed. Passports checked and double checked. Malaysia here we come”. (Well, that was a few weeks ago – and this is my review). Flying with Emirates from Amsterdam to Dubai and then Dubai onto Kuala Lumpur is a real treat. From the moment you step on board the flight there is a welcoming atmosphere and a feeling of luxury. I knew I was going to enjoy the flight, even if it was to be hours and hours long. There is the uncomfortable moment, however, as you walk through the First Class section of the plane where you are given ‘looks’ from the rather smug looking passengers in their reclining seats. They sip on their complimentary champagne and give you the ‘you wish you were here in First too, don’t you’ look. Sheepishly, the Economy passengers, myself included proceed to our zone. Seats with TV screens, or should I say ‘entertainment consoles’ are the highlight of the journey. 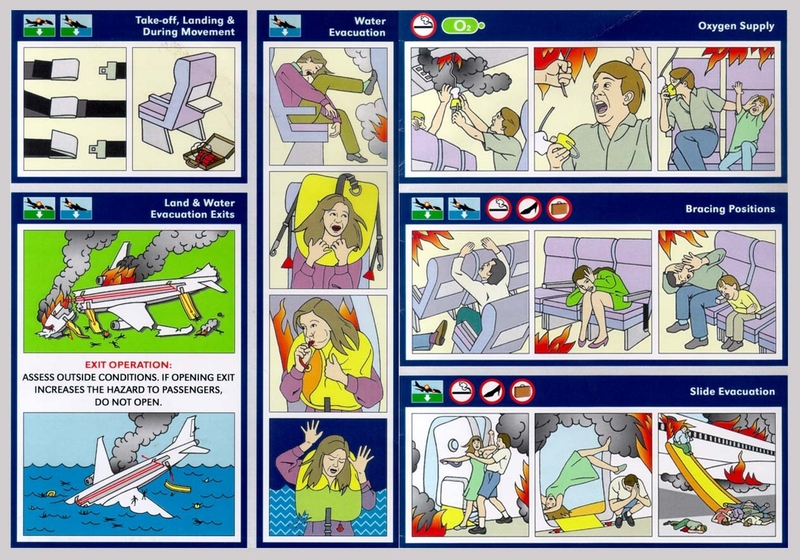 Almost every passenger feels the need, even before take-off, to play with the remote control. There is so much choice that you cannot possibly decide how to be entertained first. Should you watch a film? Maybe a TV episode would be best? The music channels sound good too? But there’s also a relaxation channel…. Limitless. Landing in Kuala Lumpur, Malaysia’s capital city, you find yourself in a series of ‘capsule’ gates. These gates are connected by a monorail which speedily carries thousands of passengers from one terminal to another. There is immediately a sense of organisation and cleanliness. Once through the passport control (and receiving the ‘okay’ from Immigration) you collect bags and join the queue for taxis at a special taxi office. They have the system worked out to perfection here. You tell one person where you would like to go, pay a standard fee (no meters used for airport runs) and then you take your ticket to the taxi stand outside. It was simple and stress-free. The airports in KL are quite a distance from the city. The views from the taxi are of endless tropical plants and trees. Malaysia has palm trees growing in every available spot. They make a great deal of money from the sale of palm oils. 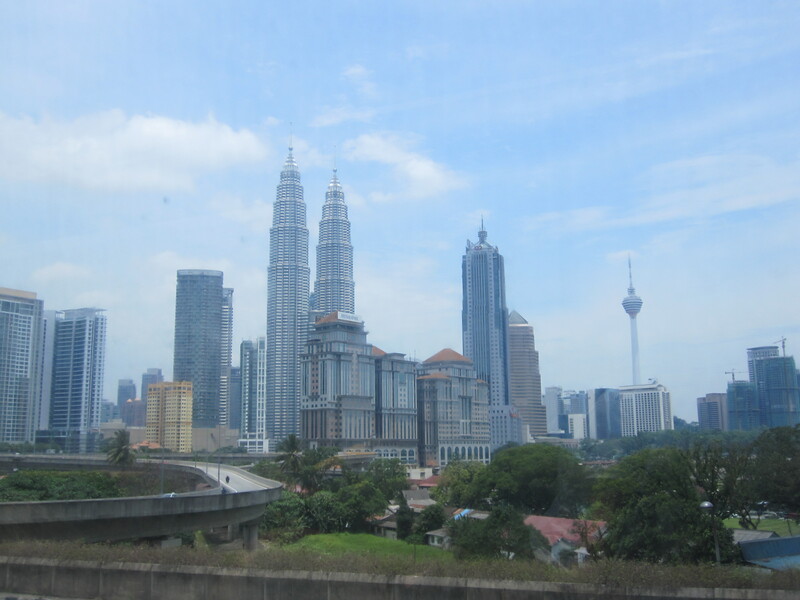 The skyline of Kuala Lumpur. Kuala Lumpur nests amongst the hills and towers up from the ground. The skyline though is far from impressive with the exception of the Petronas Twin Towers. Standing proudly amongst some rather bland looking tower blocks, the Petronas Towers amaze by the day and simply stun you by night. With a skywalk linking the two and a huge shopping mall contained within the lower floors, it is a must-see in the city. 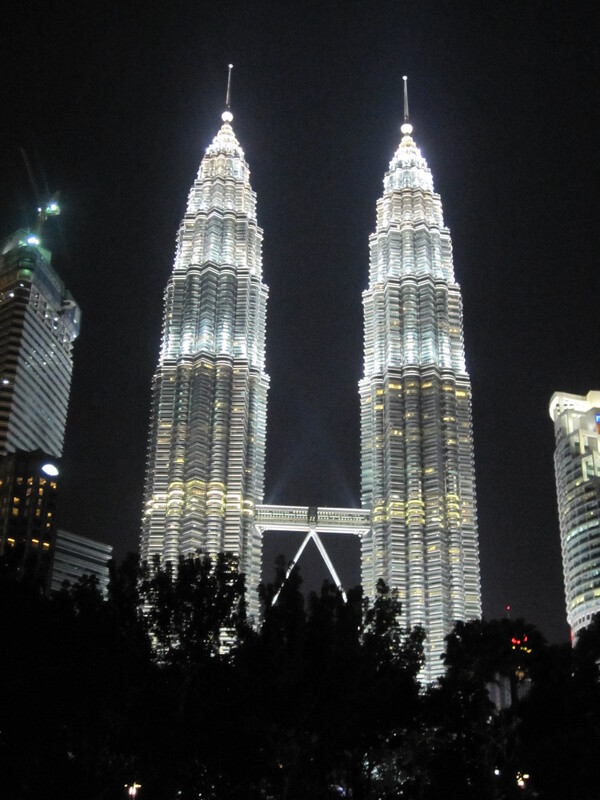 KL's Petronas Twin Towers (by night). The number of shopping malls in KL is astounding. There are simply not enough shoppers to fill the shops themselves. You can easily find yourself wandering through a mall, then leaving and discovering one even bigger and more impressive five minutes away. If you like to shop then KL is definitely worth a visit. Where KL boasts in its shopping choice it lacks in character and heart. It feels as though there is something missing when you travel through the city. There is no river or coast to give the city a focal point, something which can seem almost alien to the European traveller. In order to see the city there are a variety of choices available. You can attempt to explore on foot, but as I discovered KL is equipped with adequate pavements for pedestrians. The heat can be overpowering for anyone who wishes to tip-toe along the streets with unfinished streets. Taxis are everywhere and you never have to wait more than a couple of minutes to flag one down. There are city buses for tourists to take you to all the major sites, however it feels like an endless loop once you’re on board. China Town and the old central market are really worth a visit once you’ve seen the Petronas Towers. KL can be explored in a day or two, but while you’re there you must enjoy a massage from one of the wonderful massage parlours (superb quality and great value). Manicures and pedicures along with any other form of relaxation treatment and pampering will make you feel wonderful (I know I did). Evenings are filled by enjoying cocktails and a wide selection of meals ranging from typical Malay, to Chinese, to Thai and more. The choice is endless. Away from KL there are other sights which must not be missed. We arranged for a taxi driver to look after us for 1 day for a set price, something which is common amongst tourists. About 2 hours away from KL is the Kuala Gandah Elephant Orphanage Sanctuary. At the edge of a tiny village you can explore the sanctuary and meet some young elephants. Many of the elephants have been rescued from a variety of situations. After a video documentary explaining the work done at the sanctuary there is the possibility to feed the elephants and ride them. Some visitors are even brave enough to bathe with them. 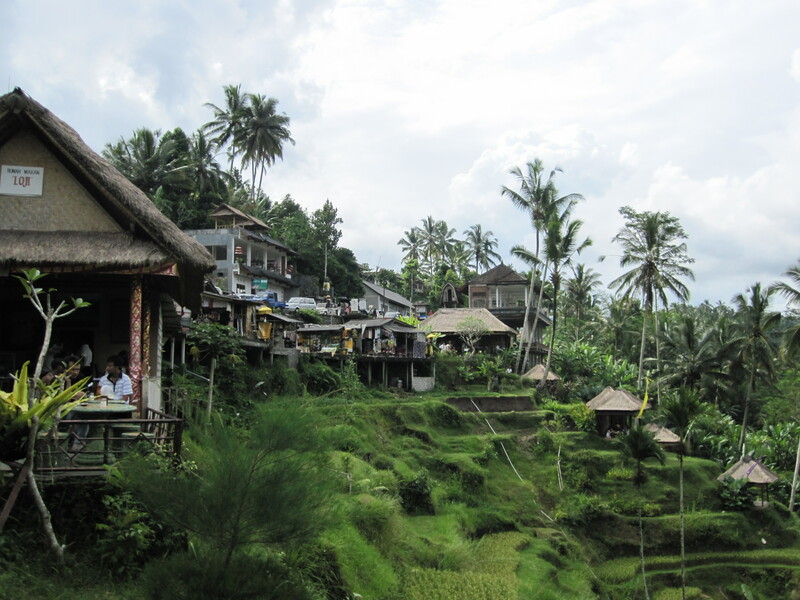 Kuala Gandah (small village by the elephant sanctuary). One of the young elephant orphans. An amazing, yet uncomfortable ride on a 37 year old elephant. Batu Caves is a surreal tourist ‘hot-spot’. A 42.7 metre (140.09 ft) high, the world’s tallest statue of Murugan, a Hindu deity, stands at the base of the steps. The 272 steps lead up into the limestone cave where Hindu shrines can be found. The steps and caves are full of monkeys which are far from shy. They leap from post to post and surprise many of the tourists (myself included). The huge golden statue stands proudly at the Batu Caves entrance.